It’s January so why not talk about the always over-hyped New Year’s Resolution. This year I have two of them and they seem to spit in the face of one another. I plan to run the NYC marathon this coming November. But as you can imagine, not many interesting articles can possibly come from training to run 26.2 miles. What I am here to discuss is a much more body damaging, energy draining resolution… In 2011 I will bar crawl my way through Hoboken, New Jersey. Every bar. Sure it’s not part of New York City, but Hoboken is essentially the 6th Borough. The trip is also cheaper than a subway, bus, cab or ferry ($1.75). It regularly ranks as one of the top U.S. cities for singles and professionals. It’s the birthplace of Sinatra, baseball, and has Buddy Valastro and his famous Carlo’s Bakery. Sure none of this propaganda seems to convince my friends from Manhattan to come visit, but if I get any more fun facts from the local chamber of commerce this year I will be sure to share them. Most of all however, Hoboken is a city of bars. 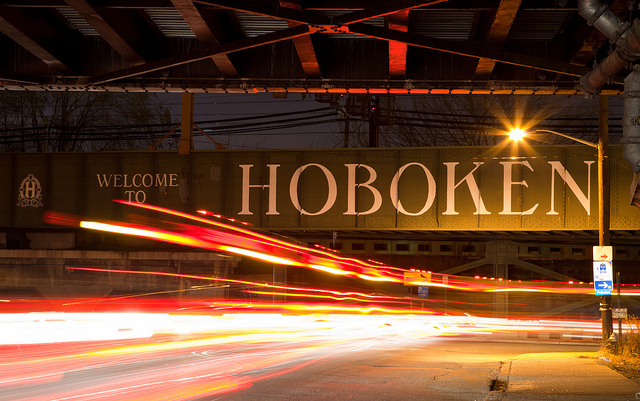 If you believe what you read on the internet, Hoboken is, or was, or will be the city with the most bars per square mile! I will have at least a drink (more likely at least 2) at every bar in Hoboken. I am classifying bars as any establishment that has a standalone physical bar and a liquor license. If a place normally is thought of as a restaurant but has a physical bar that they serve drinks from… that place is on my list. If there is a pizzeria and they happen to have a couple of beers on tap… that place is on my list. By my count there are 83 “bars” to drink at in Hoboken. (Big thanks to the guys at hoboken-bar.net for their pretty complete list of bars). You will be able to keep track of my progress through on this page and with this trusty map. If you know of a place that I don’t have on this list that meets my requirements, please let me know! I will share with you, the curious reader, my preconceived notions about the establishment, what I thought of the service, the quality of the drinks, the atmosphere, and the value. I won’t be visiting every bar at its peak time but I will keep you apprised of that in my articles. That being said so because a place was dead when I dropped by, don’t be surprised if you have to wait on a line on a Friday night. I will typically get a couple of beers on tap at each bar, but if a place is especially known for a wine, scotch, or has a special deal on any other libation I’ll give it a gander. On this journey I hope to meet some characters, hear some stories, fight off imminent liver disease, and not lose my job from showing up hungover. Hopefully this excursion is interesting enough to get the average LocalBozo fan out there to at least come off the main page and click the little “Read More” once a week…So readers, pull up (not push out) a stool, pour yourself a cold one, relax and enjoy the 2011 Bar Crawl of Hoboken.